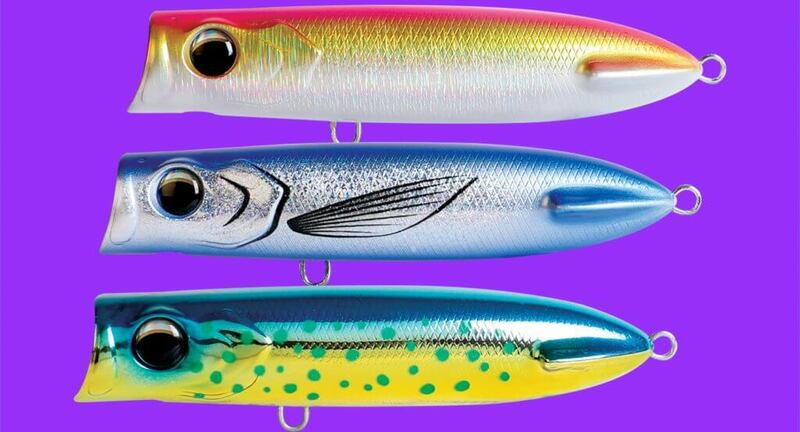 The Zerek Pugface Popper 130 is 130mm long, which is an ideal length for both small and large predatory fish – everything from tailor, salmon and small tuna through to larger trevally, queenfish and bigger tuna. It’s fitted out with heavy-duty hardware to handle the pressure from punishing encounters. The colour range, which includes 10 colours, imitates and attracts with equal measure, while the easy casting 45g overall weight allows just about everyone to cast this lure without needing some serious gym sessions. This rear-weighted lure flies from the rod tip with reduced tumbling and extra distance, giving the lure more time in the water on every cast. On the water, the Pugface makes a loud bloop that is enhanced by the chin hole that allows a massive bubble trail to add appeal both visually and acoustically. The rear tail fins help stabilise the lure in the water, reducing the likelihood of the lure flipping and rolling on the bloop.